The original rolling stock in use on the railway dates from its early days and some items pre-date the building of the line. 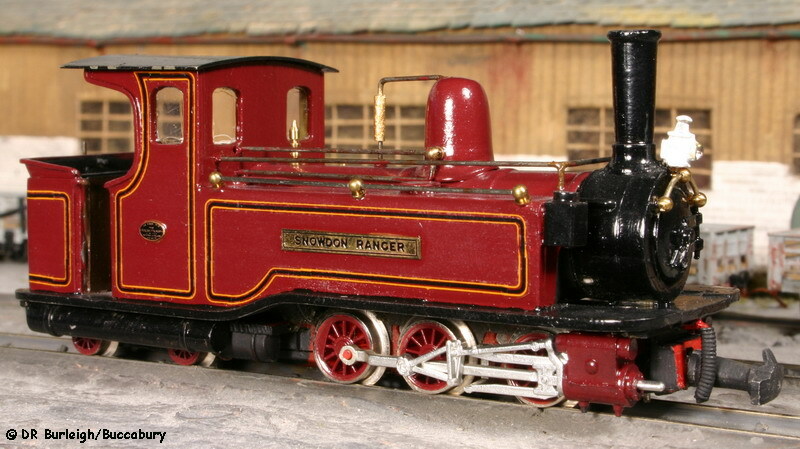 These days there is a vast choice of kits and suitable accessories in the OO9/HOe range from a number of manufacturers and most are available from Parkside Dundas, who also stock a large selection of books on narrow gauge subjects. The active locomotive roster changes and evolves. Gone are the days when I could call on only six reliable machines and found that the lack of a loop at Llanmynach was a severe restriction. I can now afford to have at least one loco constantly on shed awaiting its turn as I'd always envisaged. All the loco's have been enhanced with details such as sandbox rodding, pipework, brakehoses, whistles and especially lamp brackets with removable lamps; basically as much detail as I could fit. A feature which isn't readily apparent in the photos is that where it's appropriate they are fitted with open spectacle glasses, especially in the cab fronts where it's most noticeable in the prototype. They have also been ballasted and balanced for optimum performance and chimneys have been bored out, which greatly improves the appearance. I feel that the larger loco's carry the atmosphere of their prototypes very well and I'm able to ignore the fact that they incorrectly have inside frames - until I see them alongside the same kits as built by Stephen Sullivan and Barry John Williams with proper frames and motion! Some of the rolling stock is no longer active in normal service, and have been placed in the Railway Museum. Although some of them do still make the occasional appearance. © DRB/Buccabury As soon as they became available, a pair of Roco Austro-Hungarian 0-6-0 tanks was bought to supplement the existing fleet. 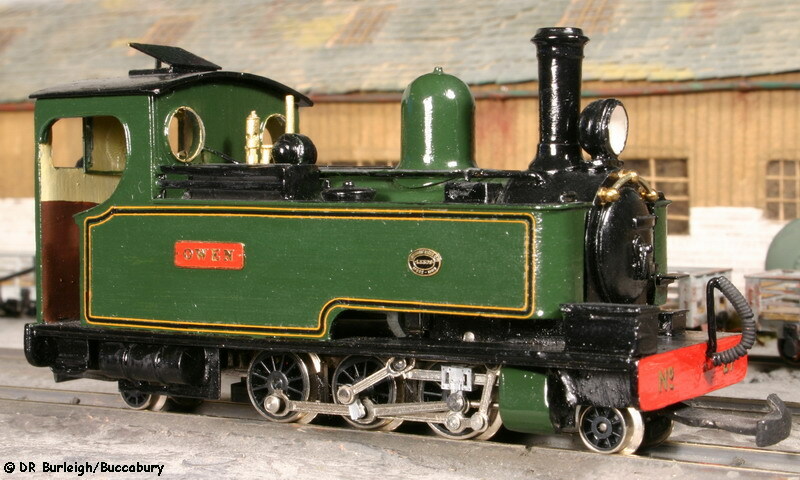 No.8 retained its original body and No.7 was given a modified Airfix 'pug' body. No.7's original chassis failed in 1987 and the two chasses were swapped to keep No.7 operational. A pair of phosphor-bronze wire pick-ups was fitted to collect current from the centre driving wheels and the body received a considerable rebuild at the same time with extra details being added, returning to service in 1988. No.7 is now the oldest loco in regular service. © DRB/Buccabury A steam railcar consisting of a modified Mikes Models brake third coach body mounted on a Minitrix Warship chassis. 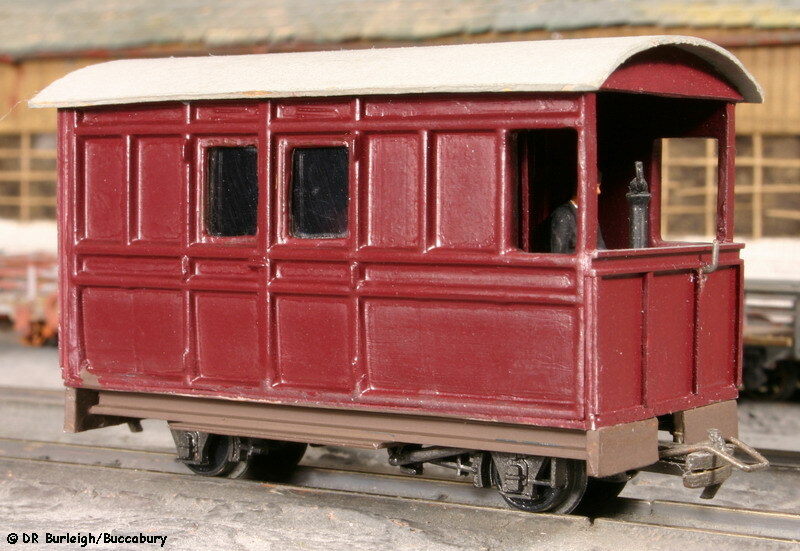 This was built to work with the Mikes Models bogie coaches and can operate as a single car or as a two or three car train, reversing without running round. © DRB/Buccabury A GEM kit on an Arnold chassis. My affection for the 'Old Lady', derived from reading Tom Rolt's 'Railway Adventure', partly inspired me to build the L&TR so it was natural that I should try to present my own interpretation her as she appeared in the 1950s, with bent and tarnished pipework. She looks quite at home on the layout. © DRB/Buccabury A friend was making plans for a OO layout with a OO9 station and as his interest was 'modern image' I built this diesel railcar with the intention of operating it on the layout, hence the non-standard livery. 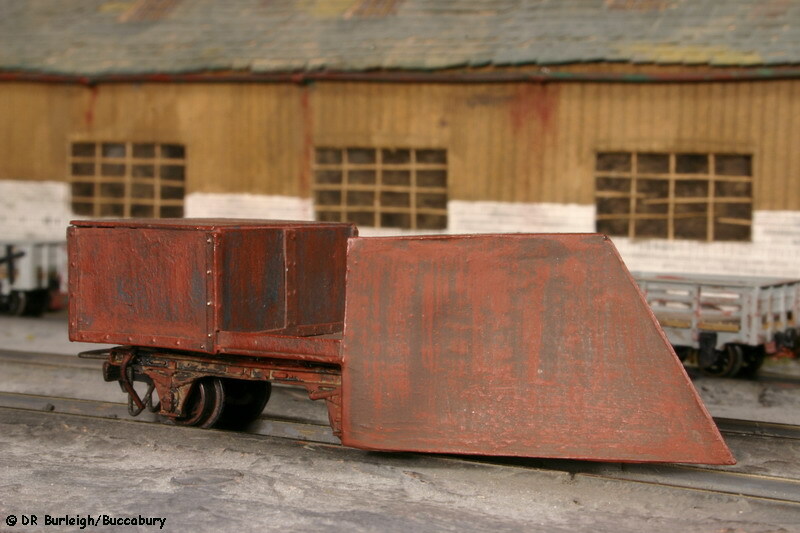 A Mikes Models brake third coach body mounted on a Minitrix Warship chassis and with the front end from an Airfix military lorry; this was heavily inspired by County Donegal railcar no 16, even down to the coupling and chains at the front. 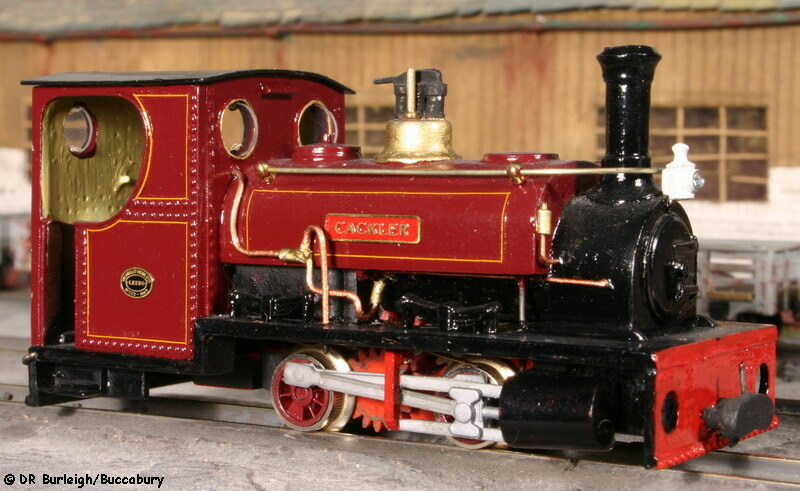 © DRB/Buccabury A Chivers kit on a Minitrix 2-6-2 chassis. This was my first real attempt at superdetailing, helped by a copy of a Bill Broadbent drawing of the loco, which gave me no excuses! The safety valve bonnet is a brass turning. Lining is the (then new) PC Pressfix GWR and name and numberplates are from the late lamented Kings Cross range. The spectacle glasses open horizontally and are so much a noticeable feature of the original I just had to reproduce them; I've made open spectacle glasses a feature of my models ever since. A couple of years ago she suffered being dropped; the cab was severely damaged and has yet to be fully repaired - the advantage is that the roof is now loose and I can get in to detail the cab! At nearly 6 ounces (170g), she remains a very heavy, powerful and reliable performer. The elegant lines of this machine are well captured in the kit and she's fitted with extra detailing. To get her around the tight curves on the L&TR the dummy frames were cut away to clear the swing of the pony trucks - they were then faced with new plastic dummy frames to retain the appearance. 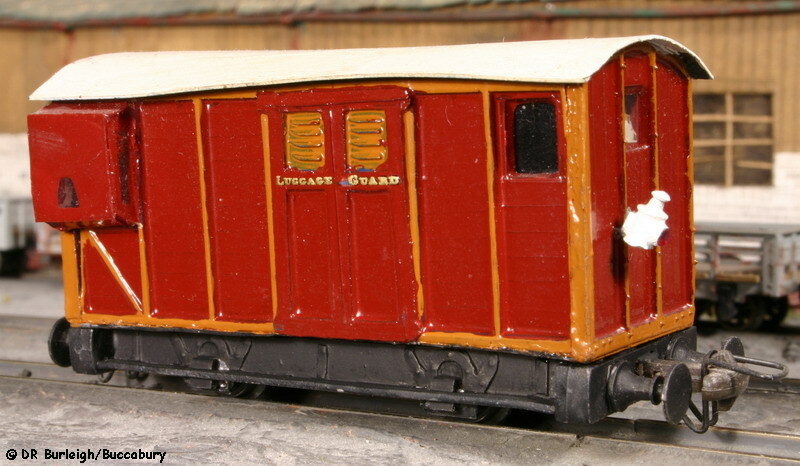 'Lew' has a fully detailed cab with the firebox built from plastic. The dome is a turned brass LBSC 'terrier' dome. Lining and lettering are PC Pressfix SR and name and works plates are from Kings Cross. At 5·7 ounces (162g), she is a good performer. The big Barclay has an Airfix 'pug' firebox in the cab (donated by No.7, where it didn't fit!). Extra detailing also includes steps on front of the tanks. The name is individual waterslide transfers marketed many years ago by Tangley Transfers and the crest is a Letraset letter 'O' on its side with a few dabs of paint. Lining is PC Pressfix GWR with one orange line carefully pared off with a scalpel. To improve the balance of the loco the bunker rear was replaced with a card one. She weighs 5 ounces (142g) and is a fine performer. Someone in Hunslet had an eye for style and proportion and this kit does the prototype justice. The sandpot is not included in the kit and this one was made from a piece of Plastrut tubing with a turned down Peco 9mm wheel for the lid. The makers plate on the Westinghouse pump is prominent in many photos and was reproduced with a small square of styrene. Lining is PC Pressfix GWR and name and works plates are from Kings Cross. The frames were adapted as for 'Lew'. She weighs over 5 ounces (142g plus) and is a well-balanced performer. 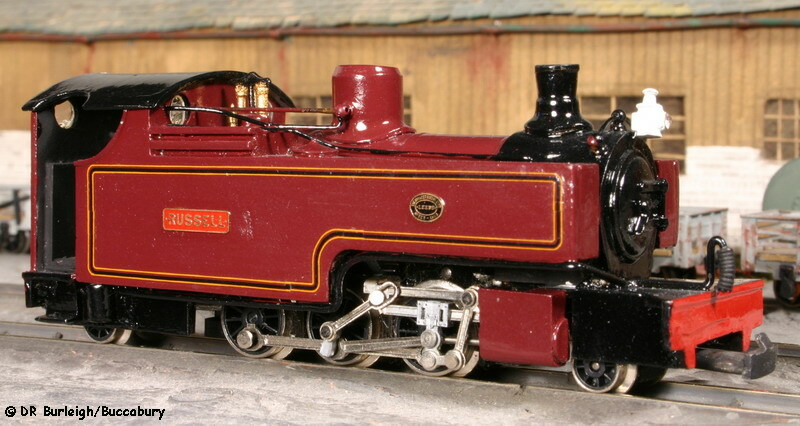 © DRB/Buccabury A Chivers kit on a Minitrix 2-6-2 chassis, depicting the loco in her cut-down form. No sandpot or air pump, of course but with additional vacuum pipework. The frames were adapted as for 'Lew'. Lining is PC Pressfix GWR and name and works plates are from Kings Cross. I got carried away with weighting her; she's slightly nose-heavy and weighs more than her 'twin' at nearly 5½ ounces (156g). She is a good performer. 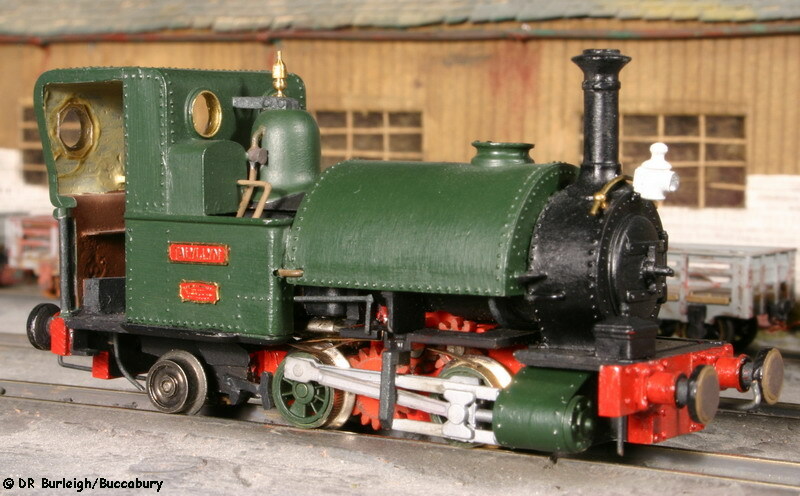 © DRB/Buccabury A Chivers kit on an Arnold 0-6-0 chassis. The design of these single Fairlies makes them difficult to balance successfully but I managed it! The cab roof has been replaced by a nickel-silver sheet, which helps and the rear bogie actually carries no weight at all. 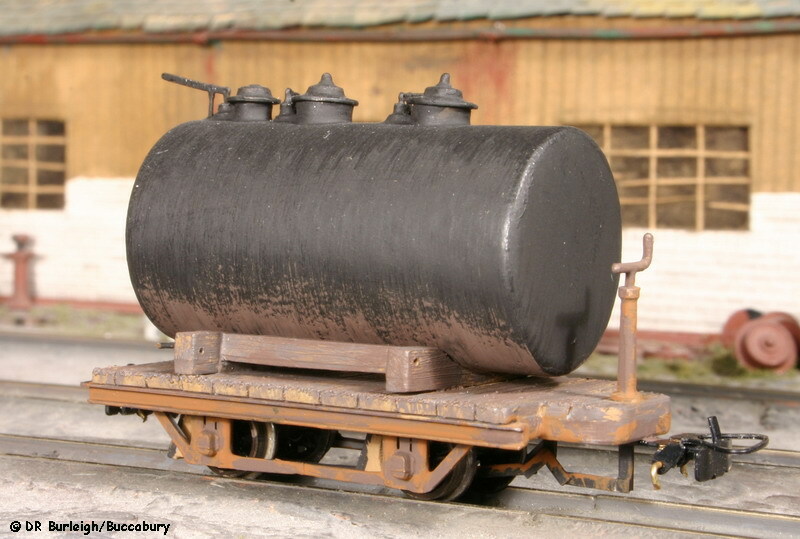 The air tanks cannot be used in service and are only fitted for photographs. The safety valve balance is reproduced using wire and insulation. Lining is PC Pressfix GWR and name and works plates are from Kings Cross. Despite her lighter weight of just over 3½ ounces (100g) and slight lack of balance she is still a good performer. © DRB/Buccabury One of the new build of Joueff Decauville 0-4-0 tanks. I've always liked these loco's and having retired the original pair I was delighted to be able to put this into service. There are a few extra details and the nameplates came from the Kings Cross range. In spite of being a lightweight, at only 1½ ounces (43g), she is a good performer, if somewhat noisy. © DRB/Buccabury A Chivers kit on an Ibertren 0-4-0 chassis. I spent 76 hours on this loco and crammed as much detail into her as I could. The cab roof is nickel-silver to help balance and the rear cab doors were opened for the same reason. 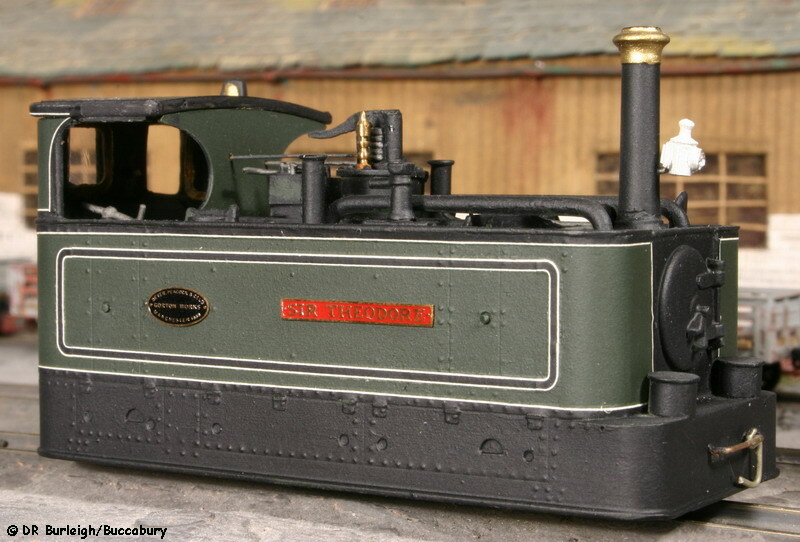 At 4 ounces (114g) she is extremely heavy for her size and although a very capable all-rounder she sees most service where she was build for - on the slate trains. Lining is PC Pressfix GWR with the black lines carefully pared off with a scalpel; nameplates are Golden Arrow and works plates are Kings Cross. © DRB/Buccabury A Peco kit on a Grafar 0-6-0 chassis. My first soldered kit and very successful too. Also the first of my models to be spray painted. Like 'Cackler', 'Sir T' was built specifically for use on the slate trains; she runs cab first as per prototype and therefore downhill through the loops to avoid the platforms which she can't negotiate because of the skirt. 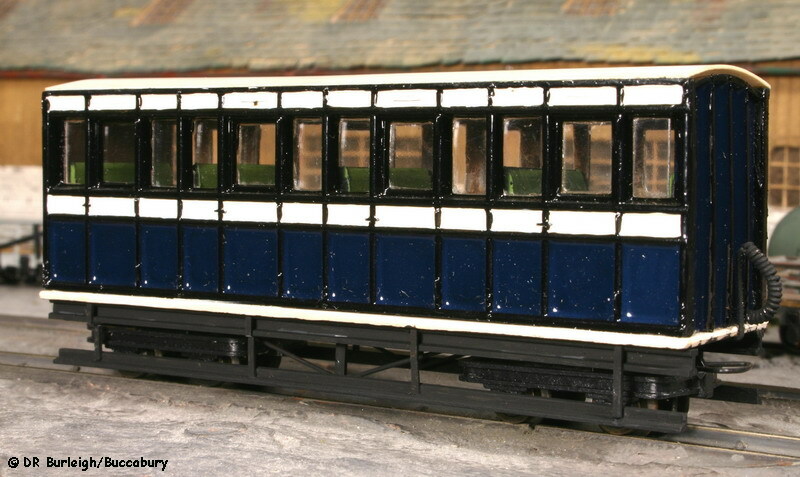 The rear windows were filed out and open glazed brass frames were fitted. Lining is LNER black and white and the name and works plates are from the Kings Cross range, bought many years ago along with the kit. 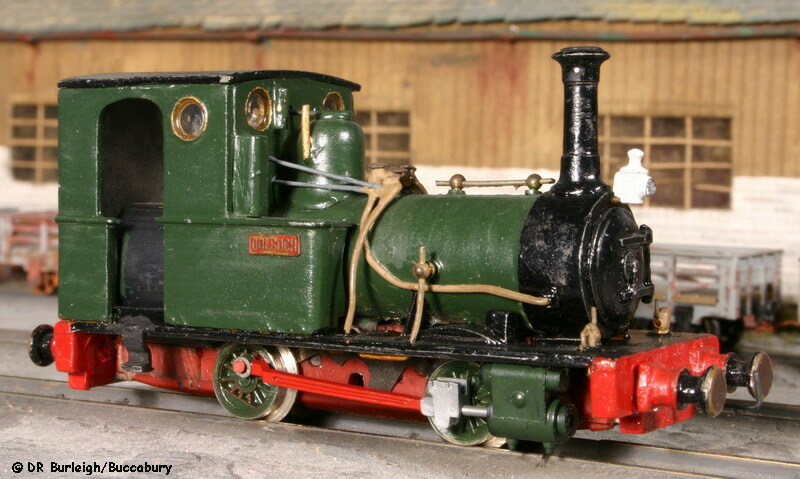 © DRB/Buccabury A Meridian kit on an Ibertren 0-4-0 chassis. At last I could run the two original Talyllyn locomotives. I've depicted her as running with a coach handle on the tank nearside, a single running 'plate' on the nearside and a sandpot in the cab. A sheet of brass was used to represent the backhead and the details were soldered to this. She doesn't run with the trailing wheels, which are used for photos only. She is a good performer and is often seen on the slate trains but also looks perfectly at home with the TR coaches in the Ffernol Valley. 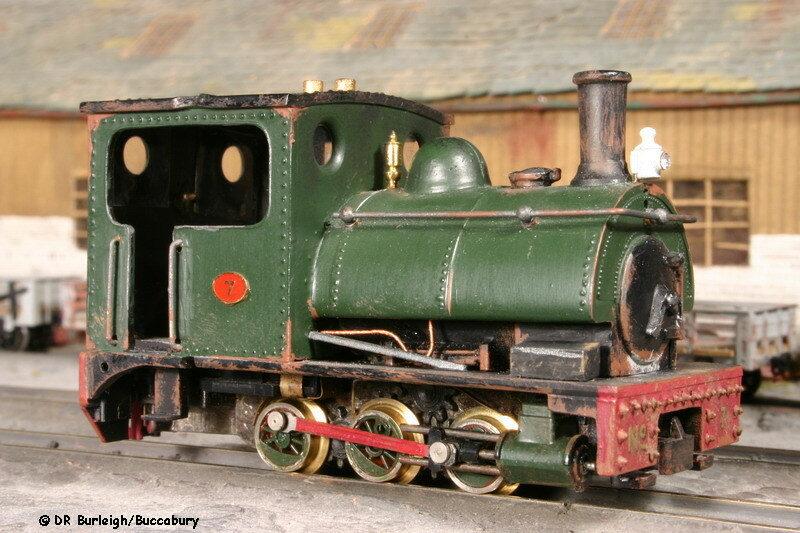 © DRB/Buccabury A Parkside Dundas kit on a Minitrix 2-6-2 chassis. I really went to town with this one. 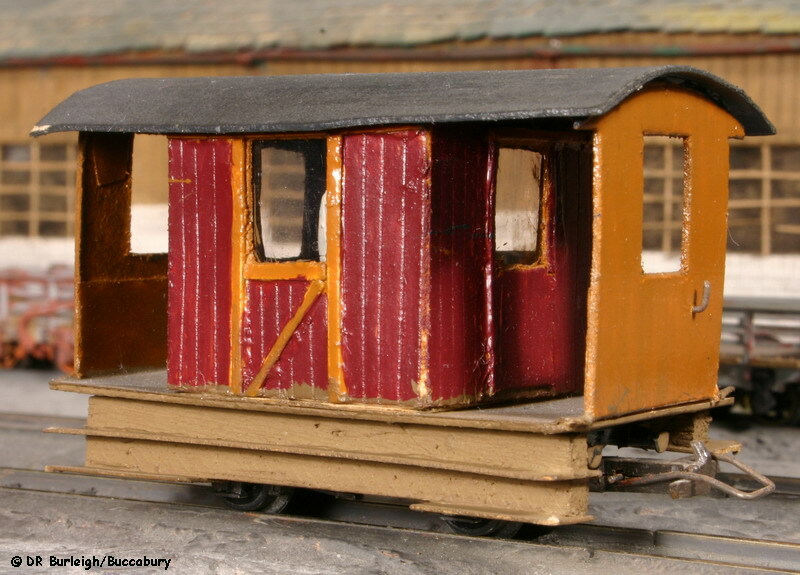 Dummy frames were soldered to the kit and she is fitted with diode controlled headlamps and a firebox lamp. 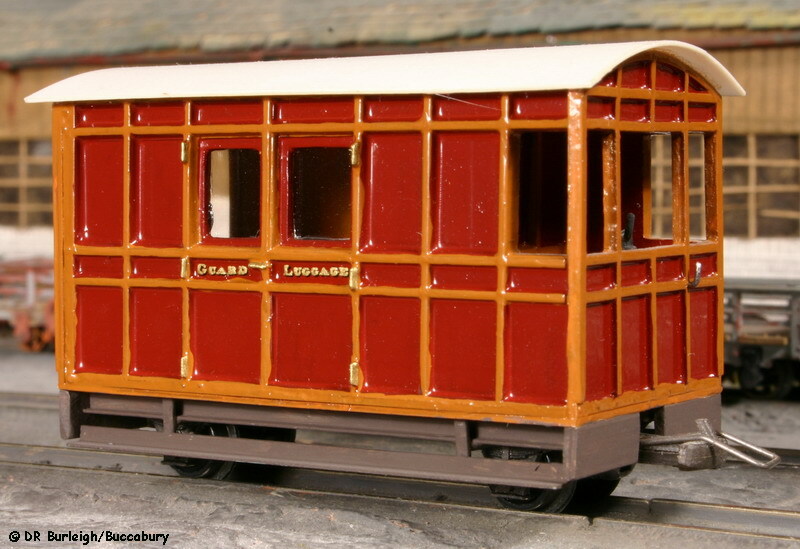 Chivers pony trucks were used to allow for the curves on the L&TR. I have a choice of cab roofs, open or closed and the extra front coal rails are sometimes used. Lining is PC Pressfix GWR and nameplates are from Kings Cross. The chassis is secondhand and a lack of current collection on the front wheels can lead to stalling on dead frog pointwork, however she is a good performer. 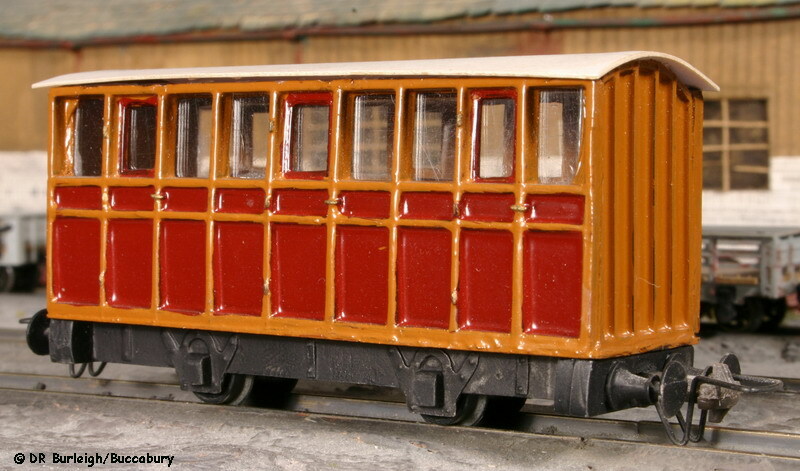 The passenger vehicles now running on the L&TR are all handbuilt. Some pre-date the railway, having been built in readiness for it, and others were built to replace the various proprietary models which were used for some years. They run in 'fixed' sets and each set has lamp brackets on the outer ends for the removable tail lamps which are as much a feature of the trains as are the removable headlamps of the locomotives. Coaches with guard's compartments have lamp brackets at both ends. They are all derivatives of Mikes Models kits and one observer has commented that he's never seen so many Mikes Models coaches on one railway! Crude by today's standards, I still feel their overall style and appearance is exactly right for a British narrow gauge railway. I'm quite honestly uncertain whether the Talyllyn coaches or the long bogie coaches came first; records seem to suggest that it was the two standard bogie coaches. The early vehicles were most definitely not built to the highest quality, being my first attempts at rolling stock kit-building and are slowly getting more decrepit. They really need to be replaced before they fall apart in service, thus providing a rather nice poetic parallel with both the Talyllyn and Festiniog Railways in the same era that the L&TR is set! Some of the rolling stock is no longer active in normal service, and have been placed in the Railway Museum. Although some of them do still make the occasional appearance. © DRB/Buccabury Comprising three Mikes Models coaches and the van. I never had a fourth coach because the Lancaster looked so very different from the Brown Marshalls. I did manage to fit seats to prevent them looking empty. I later built a couple of semi-opens from drawings of Talyllyn Nos 8 and 11 to run with them. Thanks to Worsley Works and Meridian I now have a complete train of Talyllyn originals to replace this set 'when I get around to it'. © DRB/Buccabury Very rarely these run as a set of four but generally only three will be used, the two 'standard' vehicles plus one of the modified coaches. They all have some form of interior fittings and their different ages displays the improvement in my modelling capabilities over the years. 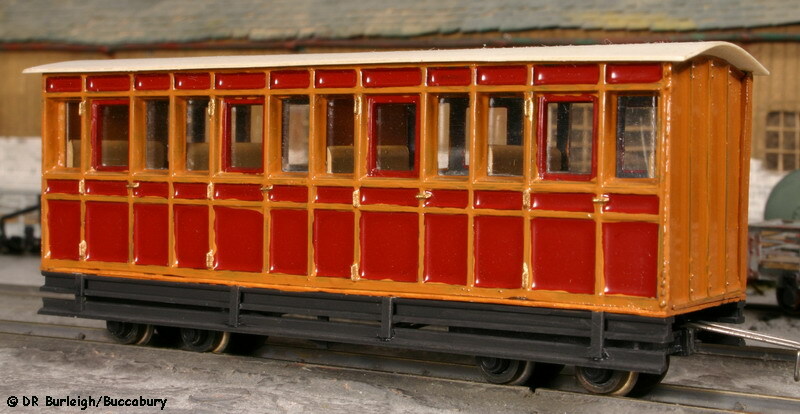 I have a set of three 'standard' replacement Mikes Models coaches under construction and these are fully detailed to even higher standards. © DRB/Buccabury One result of producing the set of 4 compartment bogie coaches was left-over bits of Mikes Models coach sides. 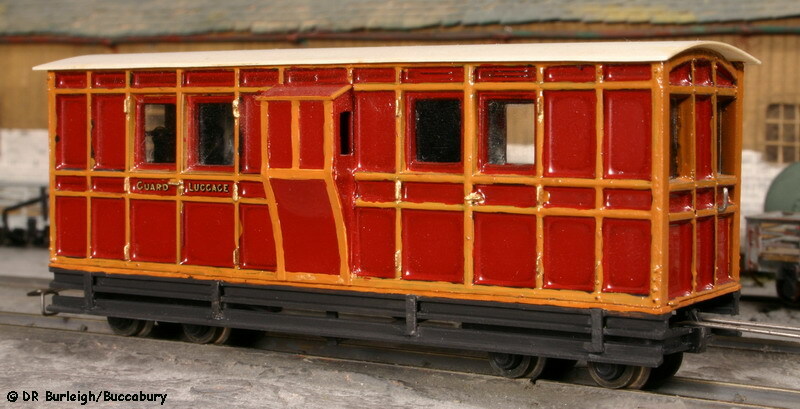 Wondering what to do with them was partly solved by building a third coach for the set, inspired by the centre-open observation coaches on the Lynton & Barnstaple Railway. © DRB/Buccabury A later addition to the fleet was this vehicle, produced by splicing together two more pairs of left-over Mikes Models side mouldings. The original bogie castings looked too short for the longer coach so I lengthened them by cutting them in half and sweating them to new, longer brass frames. These are all a result of building the trailer car for the diesel railcar. I liked the look so much that I decided to build a fleet of similar coaches to provide the third set which enabled me to retire the Lilliput Waldenburg coaches. They all run on Roco bogie bolster wagon underframes with the bolster attached to the coach underside. They use unconventional wire couplings but I have hopes of replacing these with the Greenwich type 'when I get around to it'. I would also like to add a fifth, observation coach to the set. © DRB/Buccabury Three of these Mikes Models derivatives run in the set, two are third class and the other is a composite, in a 3/1/1/3 class form. 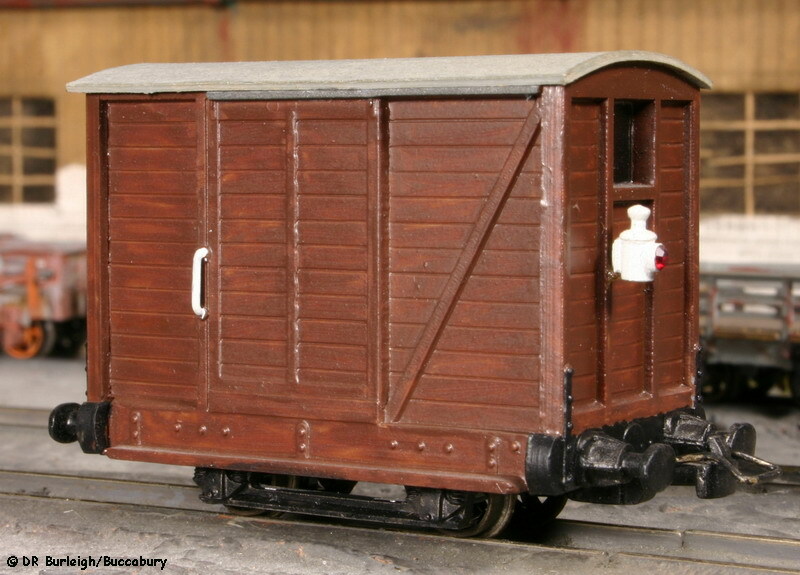 © DRB/Buccabury I always wanted a dedicated luggage van and this was built from the brake ends of two Mikes Models bogie brake coaches. The sides are spliced and the join masked by the duckets. © DRB/Buccabury Even the 'non-standard' vehicle is a Mikes Models coach! 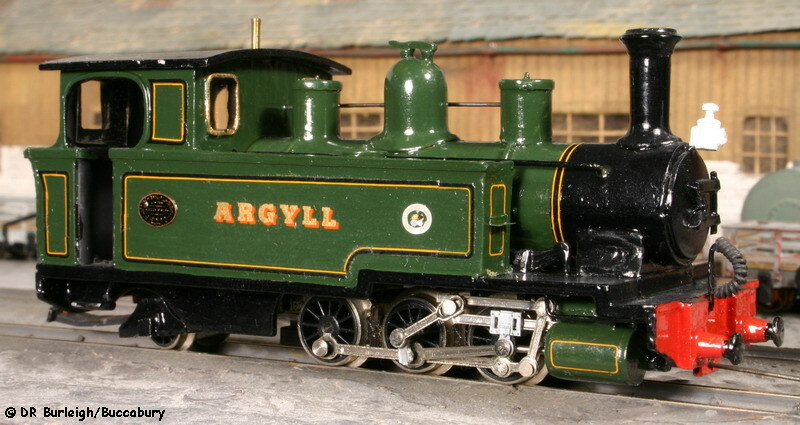 Following the lack of success of the two semi-opens in the Talyllyn set, I built this to run with it instead. Sadly couplings on the headstocks and not the bogies are not compatible with some of the curves on the L&TR and it sees very little use. © DRB/Buccabury I wanted a trailer car for the railcar but felt that a full-length Mikes Models coach was too long so decided to cut it down in length to 4 compartments, which is more in keeping with the railcar. Its success led to the 'production run' of coaches for the third passenger set. There are four brake vans in general service. All have lamp brackets at both ends and removable tail lamps. © DRB/Buccabury A very early vehicle, this was inspired by a vehicle on the Leighton Buzzard Railway and built from card. 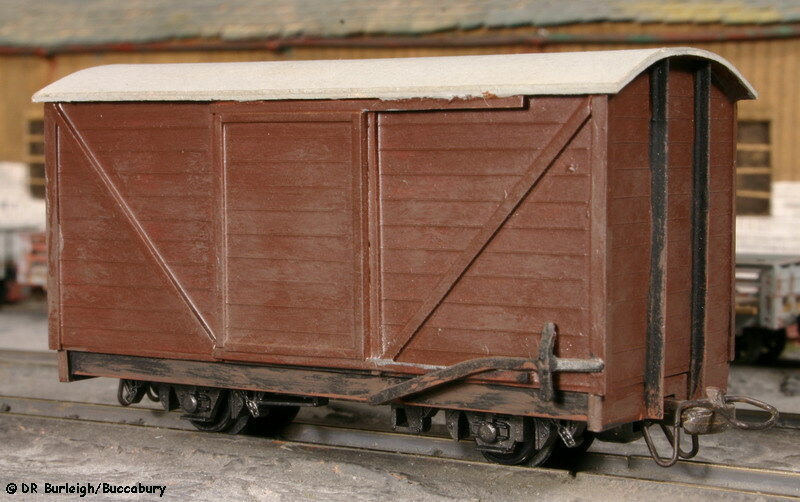 © DRB/Buccabury Built from the brake end of a Mikes Models bogie brake coach and mounted on a compressed 'N' Gauge 15ft underframe to replace one of the Egger luggage brake vans. 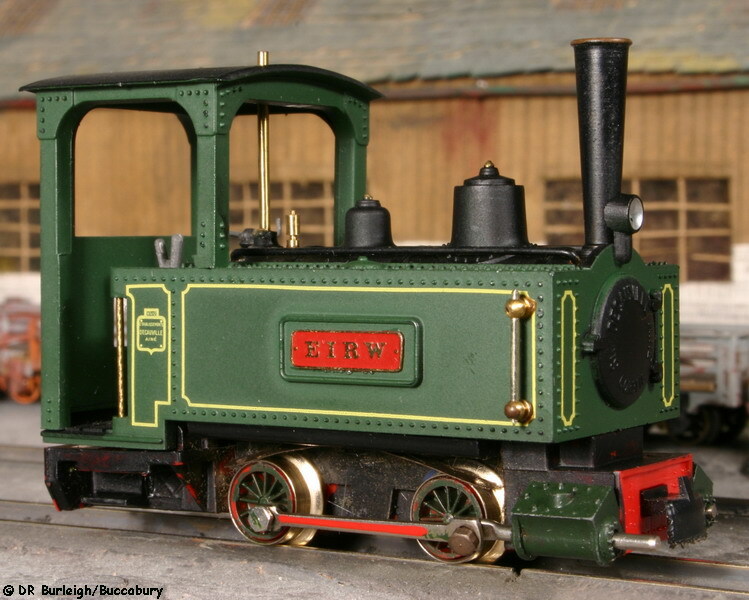 © DRB/Buccabury A Rodney Stenning kit, built specifically to run with the works trains. © DRB/Buccabury Built from the brake end of a Mikes Models bogie brake coach and mounted on a stretched Peco 'N' Gauge 10ft underframe when I realised that operations called for another van. It was given the passenger livery to enable a fourth passenger set to be run if necessary, using the two modified bogie coaches from the 'long' set. For some years the railway managed with the Egger-Bahn goods vehicles but I always wanted to replace them with handbuilt models. 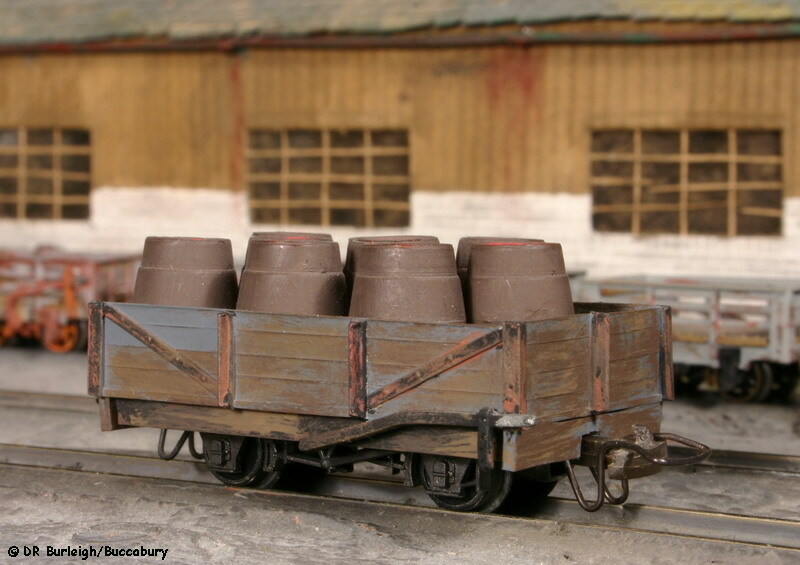 I developed a desire to make the line more of a rural 'common carrier' and this led to the batch-building of a fleet of twelve goods vehicles with three examples in each of four types. These provide the mainstay of the goods service, although they are supplemented by a few other types. Their dimensions were based on the Egger-Bahn short wheelbase vehicles and designed to allow fairly close coupling. 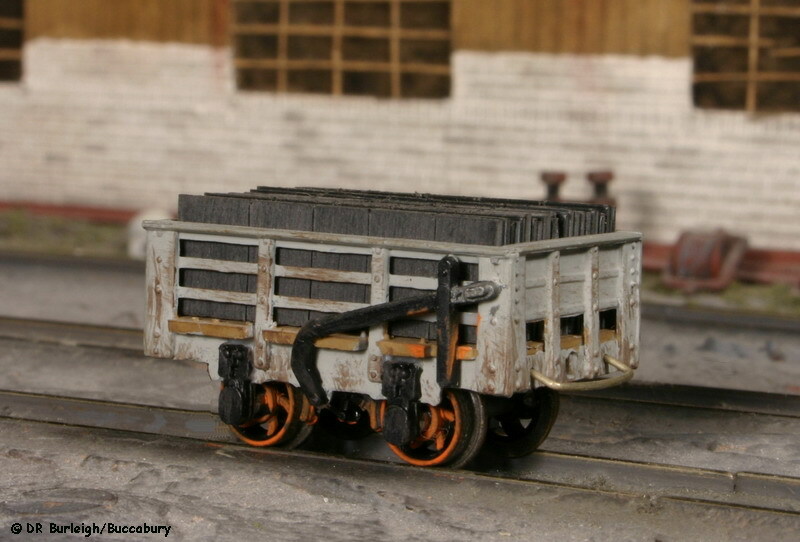 Most of the goods vehicles are mounted on Peco 10 or 15ft 'N' Gauge wagon underframes. 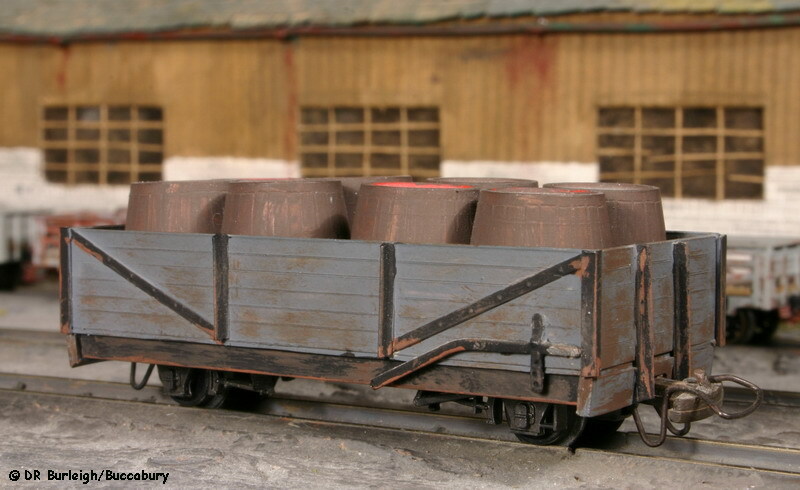 Later on I started producing selections of loads for the wagons (partly because they were of light construction). 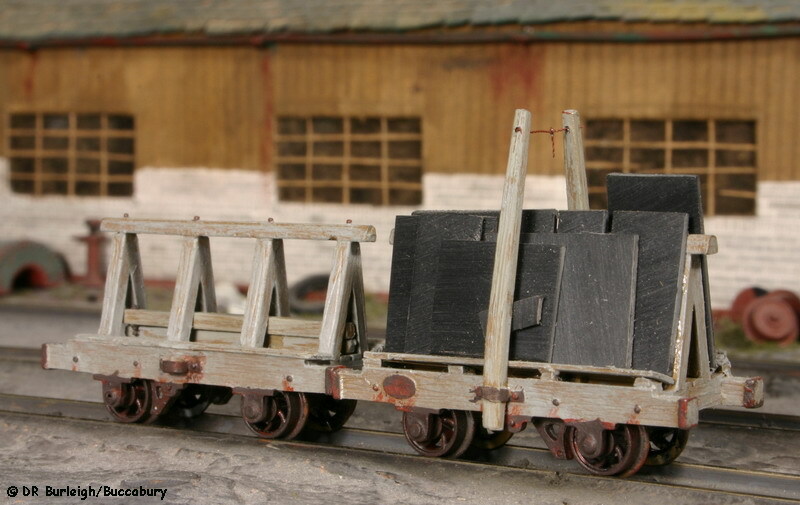 These loads are glued onto painted card bases which fit into the wagons, making loads easier to change. © DRB/Buccabury Very similar in size to the Egger-bahn wagon. 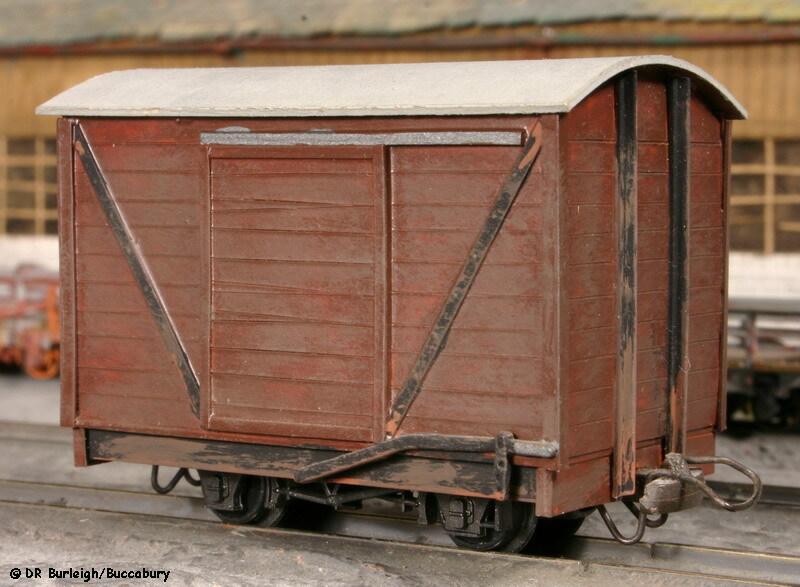 © DRB/Buccabury Very similar in size to the Egger-bahn van. © DRB/Buccabury A NineLines kit, this was built to provide some variety. Unfortunately its couplings are fitted to the headstocks which makes it incompatible with some of the curves on the railway. It remains on the 'active' roster because one day I'll get around to mounting some couplings on the bogies. © DRB/Buccabury A NineLines kit. This doesn't see extensive use but does come out occasionally. © DRB/Buccabury The 'works' train in its usual configuration; the bolster set is seen carrying a load of rails. © DRB/Buccabury Another train formation of miscellaneous vehicles which drifts around the railway. Although not readily visible in this view, Festiniog Railway Society members will appreciate that fact that the four open sided wagons in front of the water tank are numbered JGF 1, 2, 3 and 4. © DRB/Buccabury The complete set of loaded ballast tippers which also drifts around the railway. The loads are moulded into easily removable lumps. © DRB/Buccabury This uses two Roco flat match wagons, two Roco bolsters with new uprights and a third bolster chassis as a runner wagon between them. It caries a variety of loads and runs in the works train. © DRB/Buccabury One of the bolster loads is a set of rails and this was built to accompany it and form part of a permanent way train, usually running with the 'V' tipper with which it is seen here. © DRB/Buccabury A result of a scribbling on a napkin on the way back from a Model Railway Club visit to the National Railway Museum in York. This normally resides in the sheds. © DRB/Buccabury Part of the railway's history, many of these saw service as sets of mineral trains until finally displaced by the slate wagons. This is one of sixteen which now form a ballasting train. 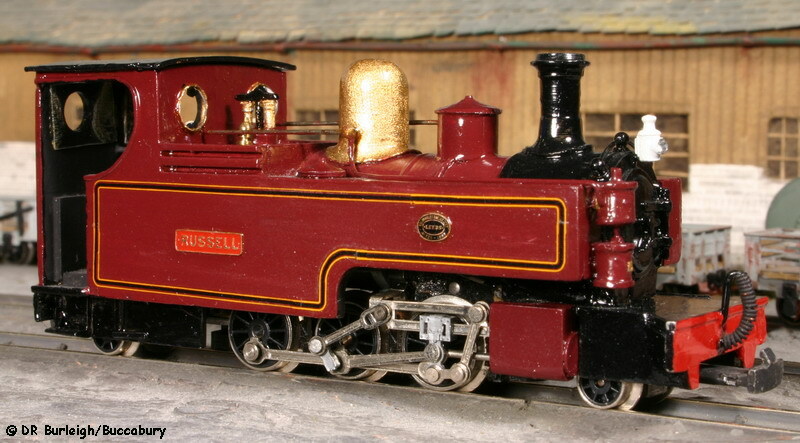 © DRB/Buccabury The first kit produced by Dundas, this spent many years dormant until I fitted it with Greenwich couplings and added it to the works train. © DRB/Buccabury Not quite finished, however it generally runs in the works train and carries emergency water supplies. 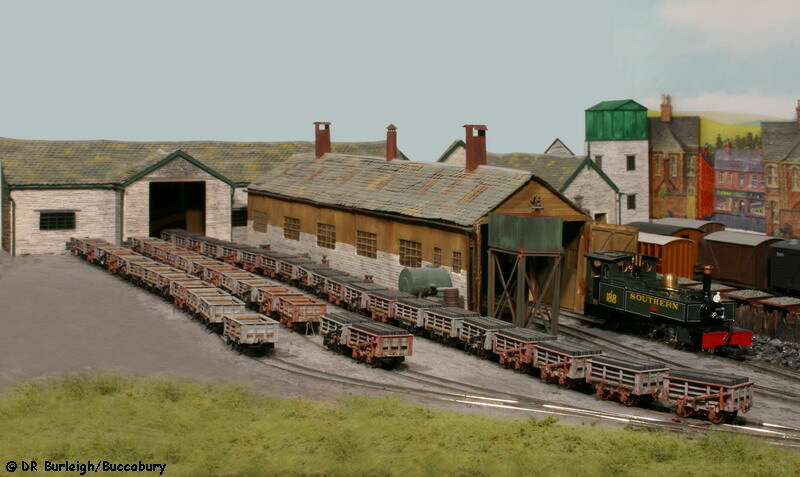 © DRB/Buccabury Looking faintly reminiscent of a photo of the Festiniog's Harbour station perhaps, this shows the entire fleet of 45 Meridian Models slate wagons comprising four 10-wagon sets, two loaded and two unloaded plus a match wagon to enable each set to be hauled by locomotives not specifically built for the slate trains. 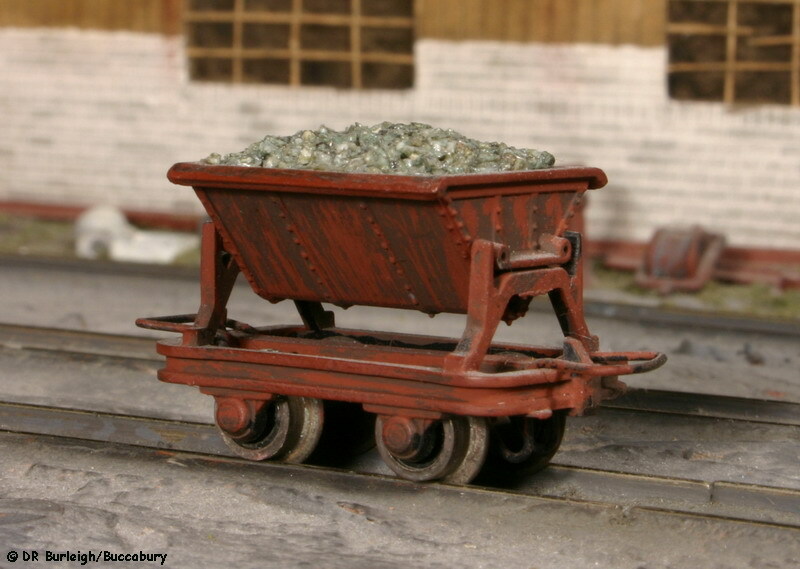 The 45th wagon is in factory-finish condition and usually resides in a siding somewhere. © DRB/Buccabury A complete slate wagon train. 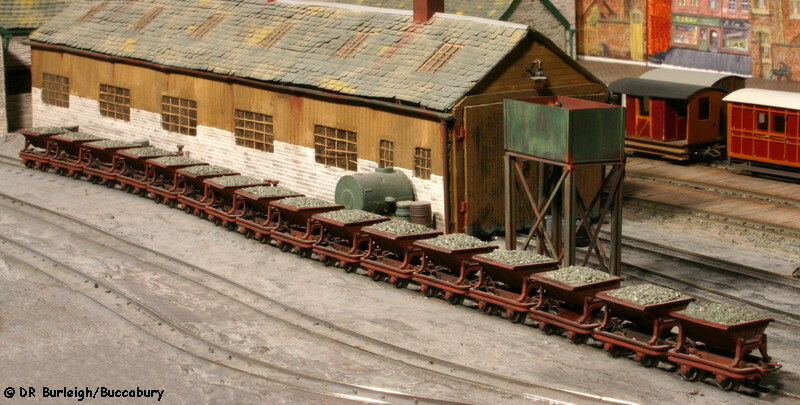 This empty set is usually to be found being hauled up the valley (clockwise around the layout) by Cackler. 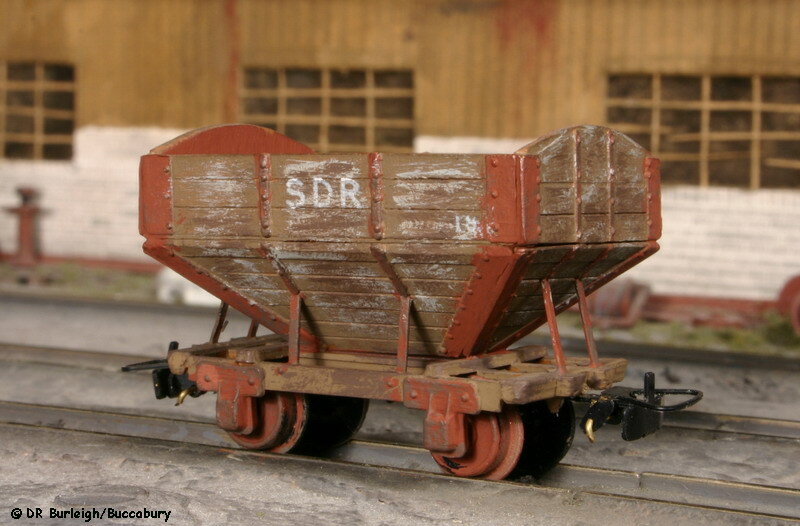 © DRB/Buccabury This example is one of four built as match wagons between one of the fixed sets and any locomotive not built specifically for the slate traffic. © DRB/Buccabury This pair of Rodney Stenning wagons isn't yet in full service but is worth listing in the 'soon to be' category. 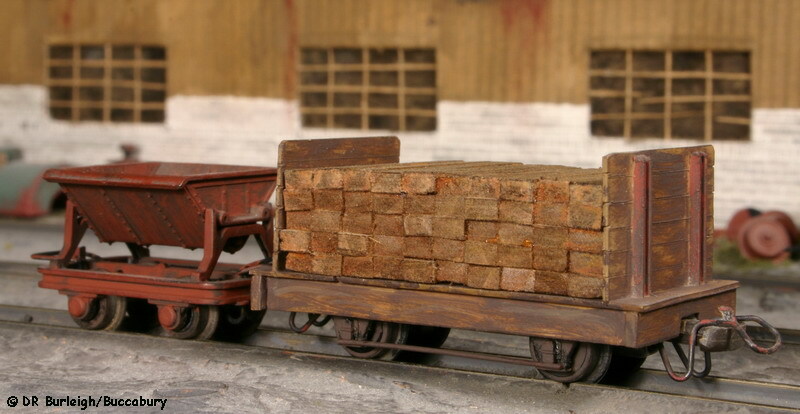 The intention is that they'll be used as match wagons as an alternative to the ordinary slate wagons.